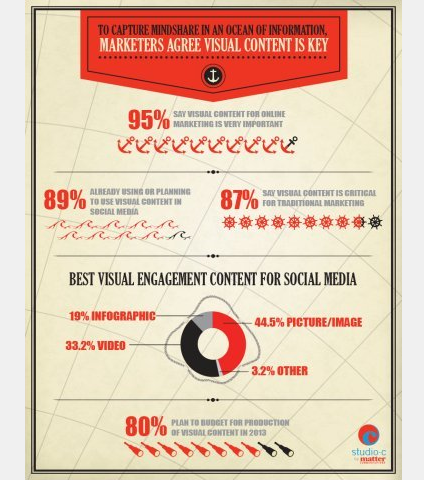 Visual content provides marketers and PR professionals with the opportunity to communicate ideas in a much richer way. 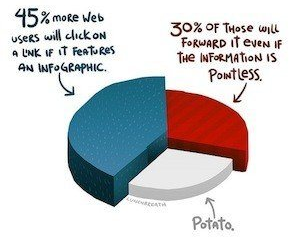 It’s easier for our brains to process visual information, and it changes the way people talk about and share information about a brand online. In an increasingly noisy digital and media landscape, we’re using visual content more to stand out across various marketing disciplines – from social media and public relations, to content strategy and even static collateral materials such as annual reports. When MTV posted a group of images on Facebook, for example, the result was 13x more engagement and sharing and reached 6x more fans. According to Facebook, FB posts that include a photo album, picture or video generate about 180%, 120% and 100% more engagement, respectively. That’s a meaningful increase! In addition, Matter Communications conducted a study and found that the best visual engagement content for social media is: picture/image (44.5%), video (33.2%) and infographic (19%). Below is the infographic Matter published to convey the study results. Visual marketing is the current breakout trend. Pictures have also become a short form way of communicating lots of information quickly and succinctly. Brands are moving away from the written word to more visual content. This is certainly a trend we’re seeing here – the more content we test on our social channels the greater clarity we get: visual content gets well over double the engagement than simply text alone. Looking forward to a few more months of testing before having our own stats on this.